Jesstours.com is a travel website that details my adventures from around the world. It’s a mixed bag of travel experiences, stories and insights. It’s also a blog that doesn’t take itself too seriously but will provide my family and friends with an outlet to keep track of my travels as well as hopefully serve as an interesting and entertaining read, with some helpful travel maps and tips for those who simply stumble across this page. Happy reading and happy travelling! 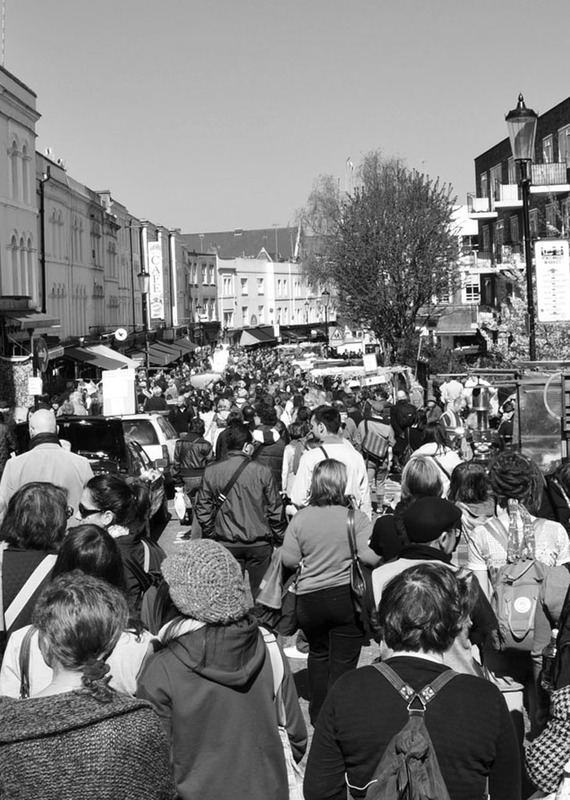 Whilst living in London a favourite weekend pastime of mine was walking down Portobello Road, come market day. Albeit rather manic (tourists descend upon the iconic London street in their droves), Saturday is still the best day to visit. It is the main trading day after all. Some shops are open during the week but the street stalls are not. Therefore if you are visiting, Saturday is the day you should go! 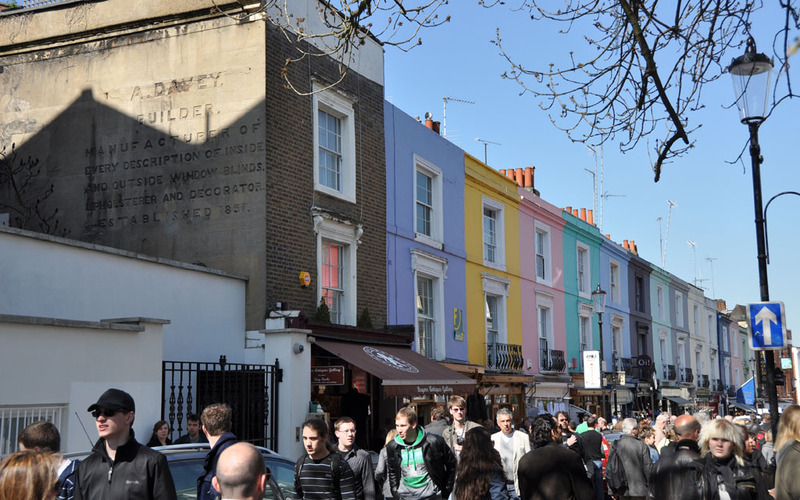 Portobello Road Market offers up a seemingly endless line of stalls selling a mix of antiques, cheap and cheerful knock offs, second hand clothes, flowers, fresh fruit and vege and so much more. 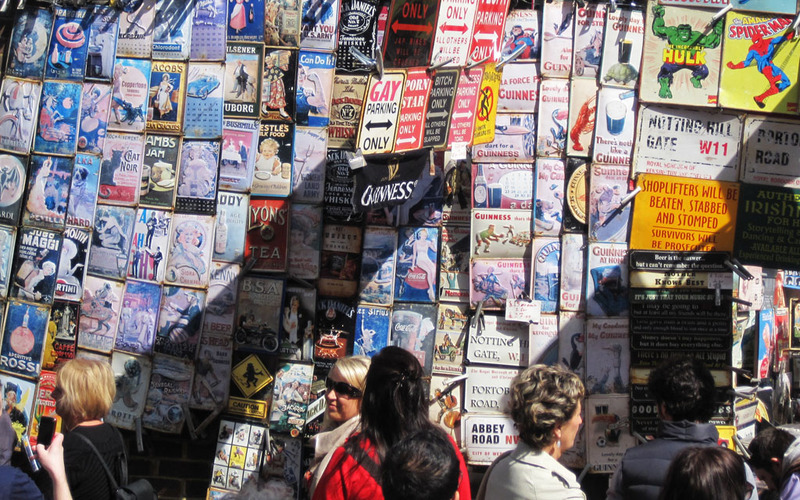 Vendors sell anything and everything from vintage bags, trinkets, jewellery, fur coats, hand knitted blankets, to the more touristy London souvenirs like ‘I love London’ t-shirts. As the market is renowned for its antique and bric-a-brac stalls, expect to find stalls selling collectables from the obscure (antique model planes, dollhouse furniture, door knobs) to the downright strange (think animal headed walking sticks). 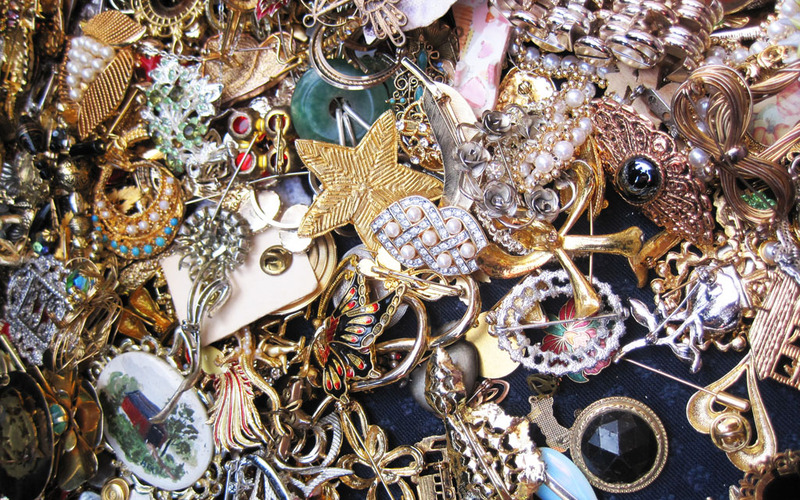 While people often come to Portobello Road looking for a great deal, you may be hard pressed to find a bargain. If you’re just looking, then the market is great fun! That’s not to say that antique hunters aren’t on the prowl, they most certainly are, scouting the stalls every weekend. The market stretches along Portobello Road for some 900 metres or so and has served the local community in North London since its beginnings in the 1880s. What began as a fresh-food market in the 19th century transformed itself into an antiques outlet when antique dealers arrived in the 1940s and 50s. The road itself is long and narrow and lined with an abundance of independent shops, art galleries, arcades and cafés. So don’t forget to pop into a few and have a look. 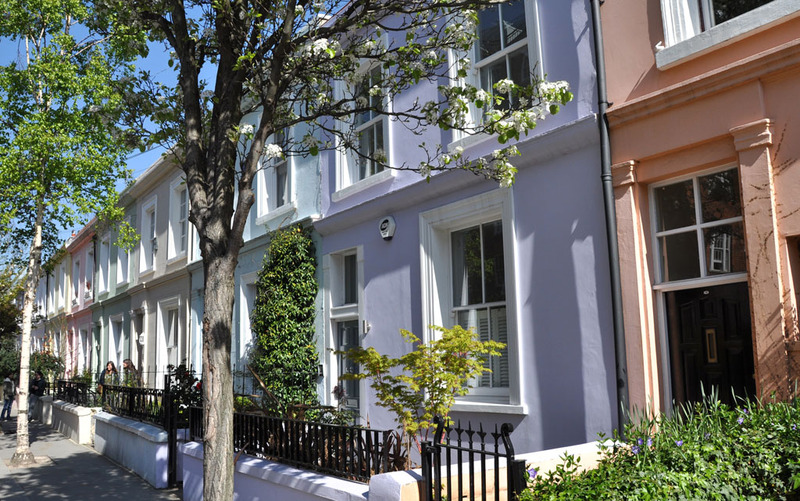 Also a stroll around the surrounding Notting Hill neighbourhood is a must! The tree-lined streets, which are filled with colourful terraces, are truly lovely. Being the ‘foodie’ that I am, it shall come as no surprise that my favourite section of the market is the line of food stalls, stretching from Elgin Crescent to Talbot Road. Not only do they overflow with delectable goodies but they are also full to the brim with English character and cheerful market banter. 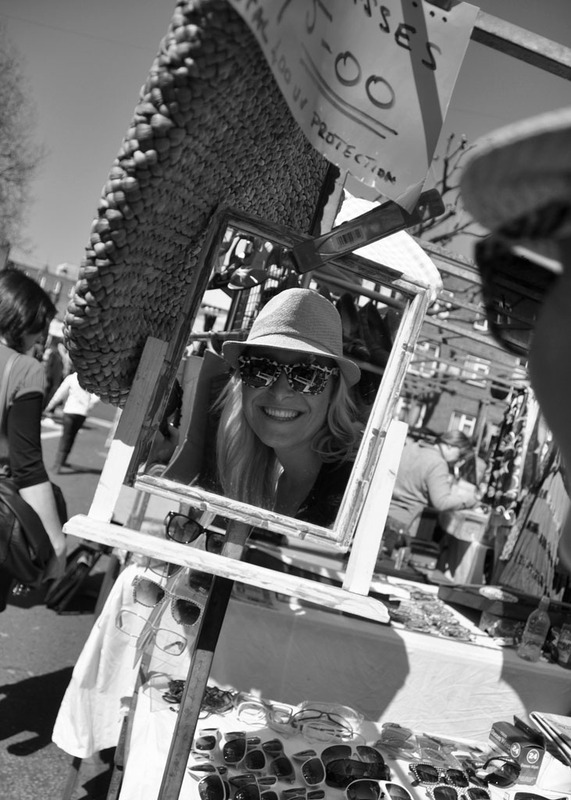 Playful and friendly exchanges can be heard between stallholders as well as between the sellers and buyers. Typical sale pitches from the fruit stall vendors tempt passers by; £1.50 for a punnet of strawberries and £2 for a bag of apples. While boisterous shouts from the fishmongers draw market goers to their catch of the day. Not only is there an array of fresh market produce (breads, cheese, cakes) on offer but also all sorts of food stuffs and street food fare from pulled pork rolls, seafood paella, gourmet burgers to deep fried crab claws. If I had to choose a favourite food stand I would have to say it would be the German van, where they serve up a variety of delicious Bratwurst, spiced pork burgers and breaded boneless chicken legs. Yum! Seating is rather hard to come by on the road itself, so I suggest heading to a cute little square just off the main drag, Colville Square. Here you can find a few benches and patches of grass to munch away on your tasty market treats. If you’re like me and get somewhat flustered winding your way through elbow-to-elbow crowds, a word of advice, try heading to the market early, before 10:30am. You can then have a proper wander around before the crowds get there. Or try later in the afternoon. Be mindful though that the market starts to wind down around 4pm onwards. Notting Hill Gate Station becomes uncomfortably congested on Saturday mornings, so if it’s a sunny day and you have the time then I would suggest getting off a stop before and walking. Queensway if you’re coming in on the Central line from the East and Holland Park from the West. Once at Notting Hill Gate Station, if you’re not sure where to go or how to get to the market, simply follow the crowd. Also there is only one ATM on Portobello Road (annoyingly positioned about halfway down the road), so make sure you get some cash out before you begin your bargain hunt otherwise you’ll be facing an extremely long line and wait for cash. Your email address will not be shown. Sit and munch away on your Portobello Road Market goodies in this quaint Notting Hill public square. © 2019 Copyright Jesstours.com All Rights Reserved.